Dental Implants have evolved over the years as one of the most successful choices for replacing missing teeth. Whether it is a single tooth that you lost during an accident or a set of teeth that needed to be removed, dental implants can replace your missing teeth in the most natural way. Implants can function efficiently for a lifetime with regular care. Our dentist in South Delhi can create dental implants with high precision that fits your smile perfectly. Now dental implants cost in South Delhi is quite affordable at Green Park Dental Clinic. People who are talkative must also have a beautiful smile. If you have lost one tooth for some reason, dental implant is the best way to have a healthy smile in just a single visit. The look, feel and function of an implanted tooth is as good as your natural ones. It don’t want the apple mashed up. I would like to enjoy it. Dentures can now be mounted on a set of 4 dental implants giving a permanent solution to your missing teeth. All on Four Treatment allows healthy and effective restoration of teeth using denture mounted on implants. It is much more comfortable than using traditional dentures. Because dentures is not the thing for the modern grand pa. I can’t live a single day with a missing tooth. Immediate Loading Implants is the latest in implant technology. In most cases, it can be used to replace missing tooth in a single visit with high precision, hence producing immediate results. Each implant is customised to an individual’s need. Missing Teeth may cause your facial muscles to sag and give you that old worn outlook. Dental Implant can restore the aesthetics and speech. 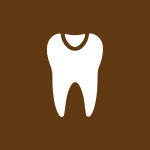 Missing teeth can cause the overall health of the teeth to deteriorate. 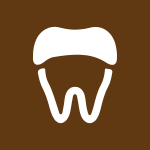 It can weaken the remaining teeth and cause gum diseases. Missing teeth may affect a person psychologically making him/her feel awkward. Dental Implants act and feel just like your natural teeth. 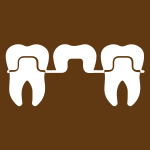 Missing teeth can lead to imbalance in the jaw structure. Extra Pressure and Discomfort is removed with dental implants. 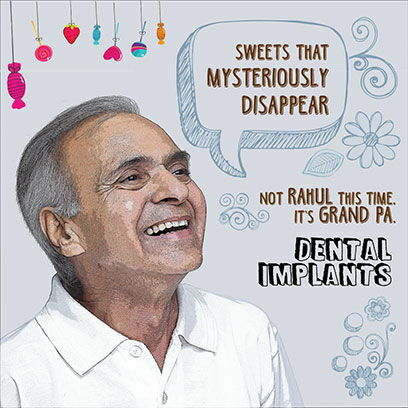 We offer a variety of options for your dental implants in South Delhi. Our range of solutions come with lifetime warranty and easy payment options so that you do not have to think twice. Merely replacing the teeth is not enough, our implantologist ensures an aesthetic and artistic replacement of missing teeth with the ones that blend perfectly.